I recently bought Sega's Rad Mobile Deluxe and it needs some work. No power. Is this pic the power supply? Can anyone tell by the pic if it's fixable? Can you still buy this game’s power supply? Could a standard arcade power supply work? It's not possible to "see" if the PSU (or any other electronic device) is not working (sometimes it is really, but those are rare cases). The easyest thing to do is test it. You need the schematics for the psu and a 10 bucks multimeter. Sadly, i've seen this all too often... and it looks like moisture damage. Dark spots are where things shorted out. So, what now? Glad you asked. It all depends on, if you want to keep everything stock, or if you just want it working again. Answer to both is replace power supply. (1) Stock: Find part number and search on google. Locking plug with 3 wires is your line input 120-240 volts, 50-60 Hz. Center wire is ground. Red and black wires, cooling fan, maybe? Please, see where they go. wires turns supply on. Some go to ground rail. Others give regulated voltage(s) to system. Ok, i searched, system name only, with not much luck. Start by carefully removing bad supply. Look for any stickers or writing on outside case. Snap some pictures of anything you find. Post them here, and i will see what information i can dig up. Fingers crossed, pin-out of plug. without first learning what each wire is for, and voltage requirements on them. Come back soon, and i'd be glad help. Almost missed blue and white wires soldered in lower right. Follow them too, to where? Or this may help you. Thank you for the info! I have the game working now but the motor driver sparks and burns when plugged in. I am all for finding an alternative motor driver but I am not sure that is possible. I am hunting down transistors and caps now to see if I can repair. Does anyone here rebuild this type of motor drivers? Looks like it's been done before. Start with cleaning 400-5117Y PCB very well. much current from driver board. 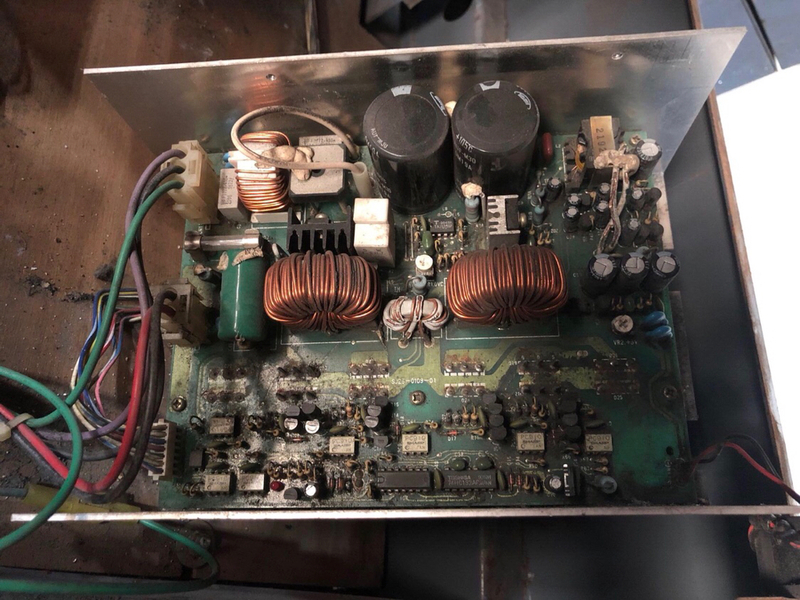 NOTE: Your mains voltage may not match their system. Set your voltage taps, according to pdf documentation, for your country. However, 12 volt output should be the same, when set correctly. [English] ; via Google translate. You have an exciting project. understand what problems it's having. Sorry i can't be there to dig in with you.